For other uses, see Syagrius (disambiguation). Probable extent of Syagrius' "kingdom"
Syagrius (430 – 486 or 487 or 493-4) was the last Gallic military commander of a Roman rump state in northern Gaul, now called the Kingdom of Soissons. Gregory of Tours referred to him as King of the Romans. Syagrius's defeat by king Clovis I of the Franks is considered the end of Western Roman rule outside of Italy. He inherited his position from his father, Aegidius, the last Roman magister militum per Gallias. Syagrius preserved his father's territory between the Somme and the Loire around Soissons after the collapse of central rule in the Western Empire, a domain Gregory of Tours called the "Kingdom" of Soissons. Syagrius governed this Gallo-Roman enclave from the death of his father in 464 until 486, when he was defeated in battle by Clovis I. Historians have mistrusted the title "rex Romanorum" that Gregory of Tours gave him, at least as early as Godefroid Kurth, who dismissed it as a gross error in 1893. The common consensus has been to follow Kurth, based on the historical truism that Romans hated kingship from the days of the expulsion of Tarquin the Proud; for example, Syagrius' article in the Prosopography of the Later Roman Empire omits this title, preferring to refer to him as a "Roman ruler (in North Gaul)". However, S. Fanning has assembled a number of examples of rex being used in a neutral, if not favorable, context, and argues that "the phrase Romanorum rex is not peculiar to Gregory of Tours or to Frankish sources", and that Gregory's usage may indeed show "that they were, or were seen to be, claiming to be Roman emperors." Despite being isolated from the surviving portions of the Roman Empire, Syagrius managed to maintain a degree of Roman authority in northern Gaul for twenty years, and his state outlived the end of the Western Empire itself, the last Emperors being overthrown or killed in 476 and 480. Syagrius managed to hold off the neighbouring Salian Franks, who were internally divided under kings including Childeric. However, it is known that Childeric had previously come to the aid of the Gallo-Romans, joining a certain officer named Paul in operations against Saxons who at one point seized Angers. Upon Childeric's death in 481 his son Clovis succeeded him. While Childeric had seen no need to overthrow the last Roman foothold in the west, Clovis assembled an army, issued a challenge, and met Syagrius's forces. Few details are known of the subsequent clash, the Battle of Soissons, but Syagrius was decisively defeated and fled. His domain passed to the Franks. As Edward Gibbon later wrote, "It would be ungenerous, without some more accurate knowledge of his strength and resources, to condemn the rapid flight of Syagrius, who escaped after the loss of a battle to the distant court of Toulouse." Toulouse was the capital of Alaric II, king of the Visigoths. Intimidated by the victorious Franks, the Visigoths imprisoned Syagrius, then surrendered him to Clovis. He died not long after, stabbed in secret according to Gregory of Tours. Despite the assassination of Syagrius, the family evidently prospered under Frankish rule. King Guntram sent a Count Syagrius on a diplomatic mission to the Byzantine Empire in 585. A descendant, Syagria, made a large donation of land to the monks of Novalesa Abbey in 739. "The last known member of the Syagrii was an abbot of Nantua who was mentioned in 757." ^ "Our Royal, Titled, Noble, and Commoner Ancestors & Cousins". Retrieved 9 September 2017. ^ Hughes, Ian (2015). Patricians and Emperors: The Last Rulers of the Western Roman Empire. Barnsley: Pen & Sword Books Limited. pp. 207, 234. ISBN 978 1 84884 412 4. Fleuriot, Léon, Les origines de la Bretagne (Paris:Éditions Payot), 1980. 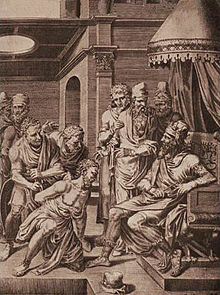 Alaric II was the King of the Visigoths in 484–507. He succeeded his father Euric as king of the Visigoths in Toulouse on December 28, 484; he was the great-grandson of the more famous Alaric I, who sacked Rome in 410. He established his capital at Aire-sur-l'Adour in Aquitaine. His dominions included not only the majority of Hispania but also Gallia Aquitania and the greater part of an as-yet undivided Gallia Narbonensis. The 5th century is the time period from 401 to 500 Anno Domini (AD) or Common Era (CE) in the Julian calendar. The 5th century is noted for being a period of migration and political instability throughout Eurasia. Year 486 (CDLXXXVI) was a common year starting on Wednesday of the Julian calendar. At the time, it was known as the Year of the Consulship of Basilius and Longinus. The denomination 486 for this year has been used since the early medieval period, when the Anno Domini calendar era became the prevalent method in Europe for naming years. Childeric I was a Frankish leader in the northern part of imperial Roman Gaul and a member of the Merovingian dynasty, described as a King, both on his Roman-style seal ring, which was buried with him, and in fragmentary later records of his life. He was father of Clovis I, who acquired lordship over all or most Frankish kingdoms, and a significant part of Roman Gaul. Euric, also known as Evaric, or Eurico in Spanish and Portuguese, son of Theodoric I, ruled as king (rex) of the Visigoths, after murdering his brother, Theodoric II, from 466 until his death in 484. Sometimes he is called Euric II. The Salian Franks, also called the Salians, were a northwestern subgroup of the earliest Franks who first appear in the historical records in the third century. In historiography, the Kingdom or Domain of Soissons refers to a rump state of the Western Roman Empire in northern Gaul, between the Somme and the Seine, that lasted for some twenty-five years during Late Antiquity. The rulers of the rump state, notably its final ruler Syagrius, were referred to as "Kings of the Romans" by the Germanic peoples surrounding Soissons, with the polity itself being identified as the Regnum Romanorum, "Kingdom of the Romans", by the Gallo-Roman historian Gregory of Tours. Whether this title was used by Syagrius himself, who claimed to be governing a Roman province and not a state independent from central imperial authority, or was applied to him by the barbarians surrounding his realm in a similar way to how they referred to their own leaders as kings is unknown. The Battle of Soissons was fought in 486 between Frankish forces under Clovis I and the Gallo-Roman domain of Soissons under Syagrius. The battle was a victory for the Franks, and led to the conquest of the Roman rump state of Soissons, a milestone for the Franks in their attempt to establish themselves as a major regional power. Basina or Basine was a queen of Thuringia in the middle of the fifth century. The Battle of Orléans took place in the year 463 pitting the forces of the Kingdom of Soissons, under the command of the magister militum Aegidius, against those of the Visigoths who were commanded by the Visigoth King Theodoric II and his brother Federico.